Democratic Florida gubernatorial nominee Andrew Gillum concedes the race in Tallahassee, Nov. 6, 2018. Results were disappointing for two Democratic candidates who vied to become the first African-American state governors of Florida and Georgia, after closely contested campaigns where race and identity politics were highly divisive issues. In Florida, Democratic nominee Andrew Gillum, the former mayor of Tallahassee, conceded the race to his Republican rival Ron DeSantis, but he vowed to remain politically active. "I want you to know that in spite of our congratulating him on his victory this evening, nothing that we believe in is compromised," Gillum told his supporters Tuesday evening. Florida Governor-elect Ron DeSantis, right, answers questions from reporters, with his wife Casey, after being declared the winner of the Florida gubernatorial race at an election party in Orlando, Fla., Nov. 6, 2018. 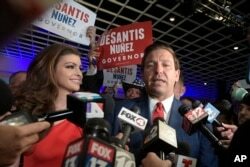 DeSantis, a former U.S. Congressman, was closely aligned with President Donald Trump, who came twice to Florida to campaign with him. "The great thing about our country is that every two years, the people have that one day in November where the elites don't call the shots, where they don't get to craft the narrative and where they don't get to set the agenda," DeSantis said. In Georgia, the race for governor is too close to call, but Republican candidate Brian Kemp holds a narrow lead. "There are votes left to be counted, but we have a very strong lead. And folks, make no mistake, the math is on our side to win this election," Kemp told supporters gathered in Athens, Georgia. Georgia Republican gubernatorial candidate Brian Kemp gives a thumbs-up to supporters in Athens, Ga., Nov. 7, 2018. However, Democratic nominee Stacey Abrams has not conceded and says the race could come down to a run-off election if neither candidate wins 50 percent of the vote. "But I'm here to tell you tonight, votes remain to be counted. There are voices that are waiting to be heard," Abrams told her supporters in Atlanta. In other parts of the country, race and gender barriers were overcome as Native American and Muslim candidates won congressional elections. Massachusetts and Connecticut will also send black women to Congress as firsts for their states. Both Abrams and Gillum hoped to become the first African-American governors in Georgia and Florida, southern states with legacies of racial division, and where Democrats have not held the state leadership position in over a decade. Both Democratic candidates ran as progressives. Both campaigns promised to make health care more affordable and focused on increasing voter participation from the growing number of young people and minorities in the state that often don't participate in elections. 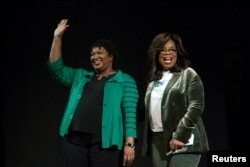 FILE - Oprah Winfrey takes part in a town hall meeting with Democratic gubernatorial candidate Stacey Abrams ahead of the midterm election in Marietta, Georgia, Nov. 1, 2018. Abrams attracted high-profile support from influential talk show host and billionaire philanthropist Oprah Winfrey. "I believe that everybody should have the right to vote their values, and vote their conscience regardless of the party," Winfrey said when endorsing Abrams for governor. In Florida, Gillum campaigned with former President Barack Obama. Kemp, Abrams' Republican rival, has been accused of trying to suppress the vote in his current role as Georgia's secretary of state in charge of overseeing the election. Last week, a federal judge put on hold an "exact match" voter registration law enforced by his office, after lawsuits alleged that 80 percent of voters disqualified for slight ID variations were African-American, Latino or Asian-American. 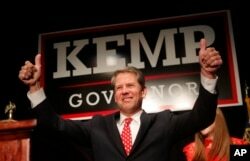 Kemp has refused to recuse himself to avoid possible conflict of interest charges. And on the eve of the election, Kemp opened an investigation into the Georgia Democratic Party for possibly tampering with the state's voter registration system. Abrams called the investigation a "witch hunt" and "abuse of power." Many Georgia voters from both parties on Tuesday said racial politics was not a deciding factor in this election. "I don't think it had anything to do with race. It has to do with what the individuals are saying and how they're going to help the people in the state of Georgia," said Linda Crumpton, who voted for Kemp. In Florida, DeSantis was criticized for using coded racist language when he said Gillum would "monkey the state up" in an interview. The Republican nominee also struggled to explain his alleged association and support from white supremacist groups. "I'm simply saying the racists think he is a racist," said Gillum in a debate with DeSantis, who in turn criticized Gillum's alleged association with a left-wing activist group that compared the police to "slave catchers."